Go to the transaction Financial accounting transfer [SAL11]. 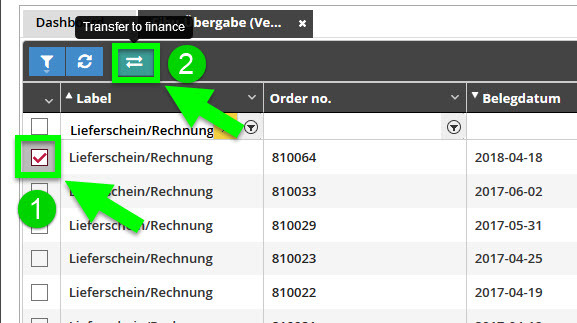 Select the desired invoice with a checkmark and click on the green Transfer to finance-button. If the invoice is not settled yet, you can find it in the transaction Open Items [FIN07]. Paid invoices are listed in the transaction Clearing/Matching [FIN08]. When saving the A/R credit memo, reybex asks you directly whether it should be transferred to financial accounting or not.